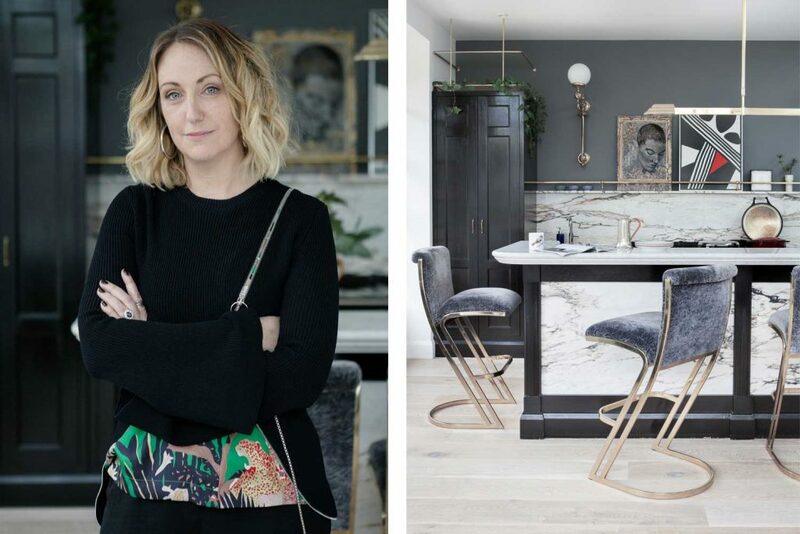 After a fire destroyed her family’s home, artist Eva O’Donovan set about rebuilding it into a bolder, braver and more colourful version of it’s former self with the help of interior designer Suzie McAdam. 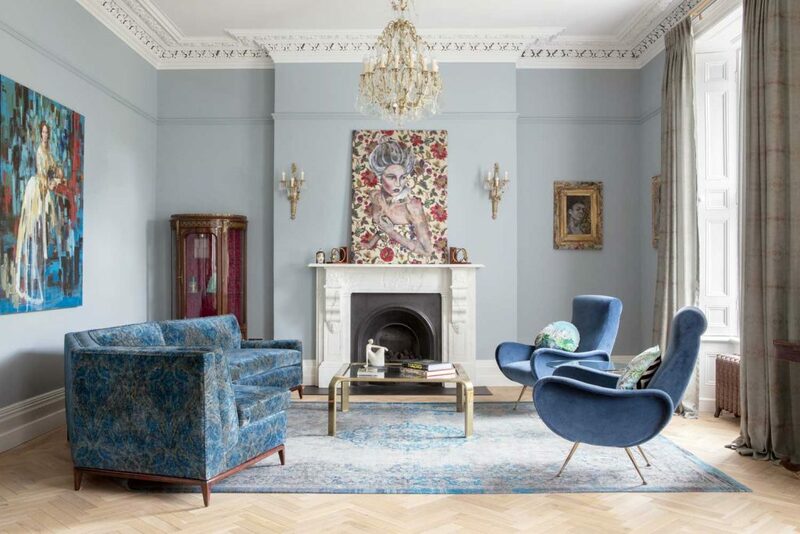 The drawing room’s double-ended design is a nod to French-classic apartment style. 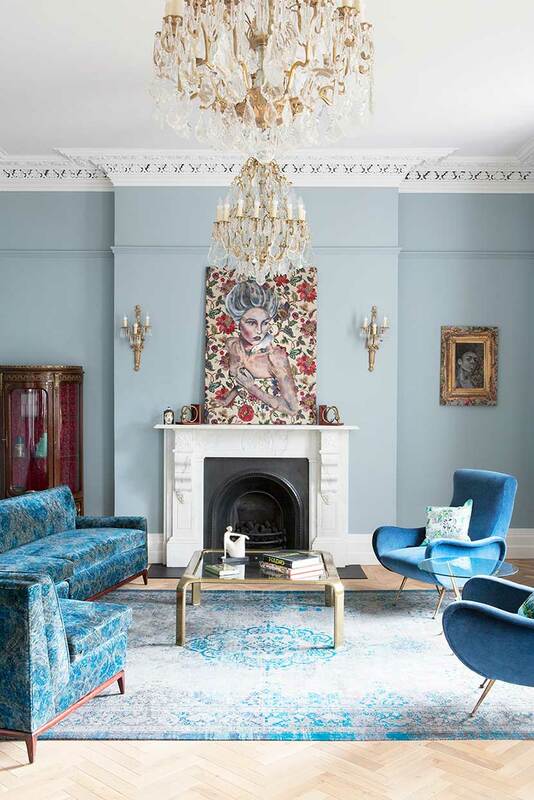 The blue sectional couch was purchased from Mid-Century Online and covered in distressed Mulberry velvet paisley fabric to add to the antique feel of the room. 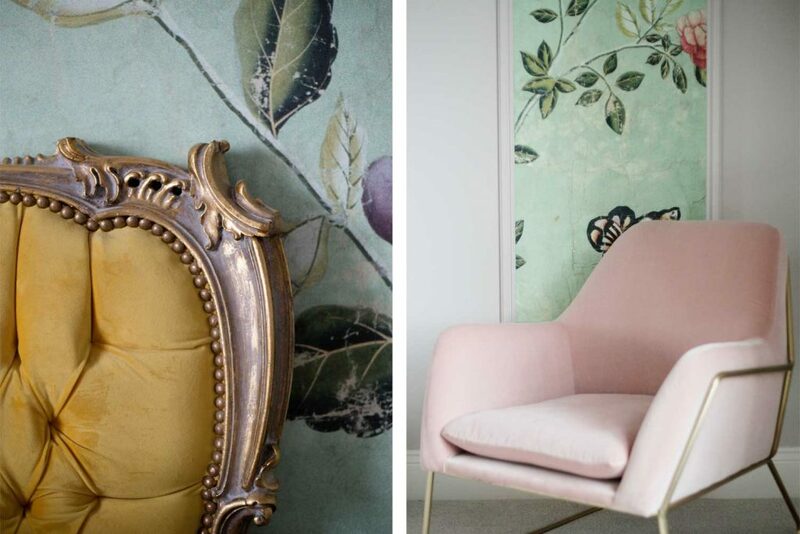 The Gio Ponto lounge chairs, one of interior designer Suzie Mc’Adams favourite additions to the house, are from Michael Mortell who is one of Irelands premier specialists in mid-century design. The walls are painted Bone China Blue by Little Green Paints and framed with Eva’s artwork. A vintage rug covers the lightly smoked herringbone oak floor. 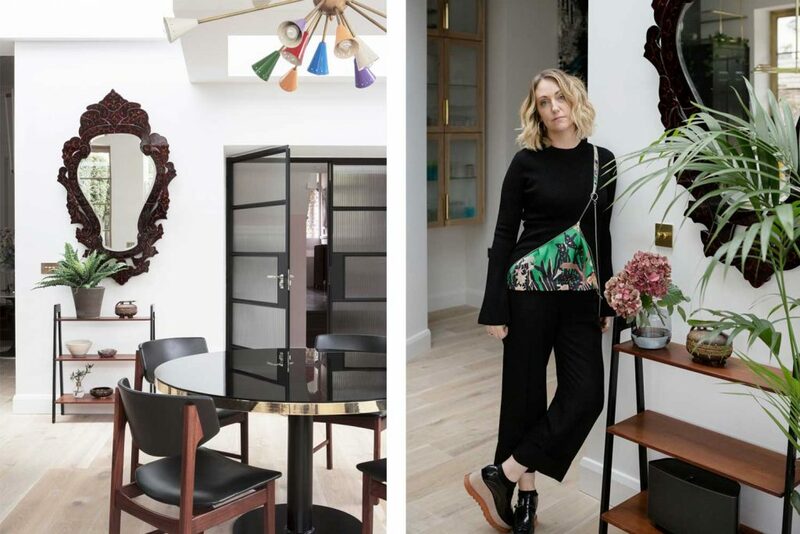 Eva’s love of antiques and mid-century come together in this room: the chandelier and vitrine, both bought at antique auctions, marry with the brass coffee table from Mid-Centruy Online. 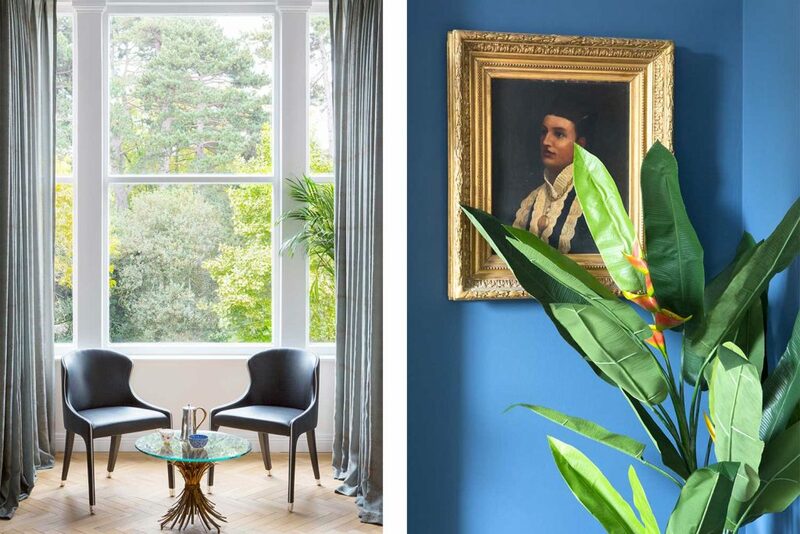 Left: A pair of leather Roche Bobois chairs frame the bay window in the drawing room on the first floor along with a side table from Mid-Century Online. 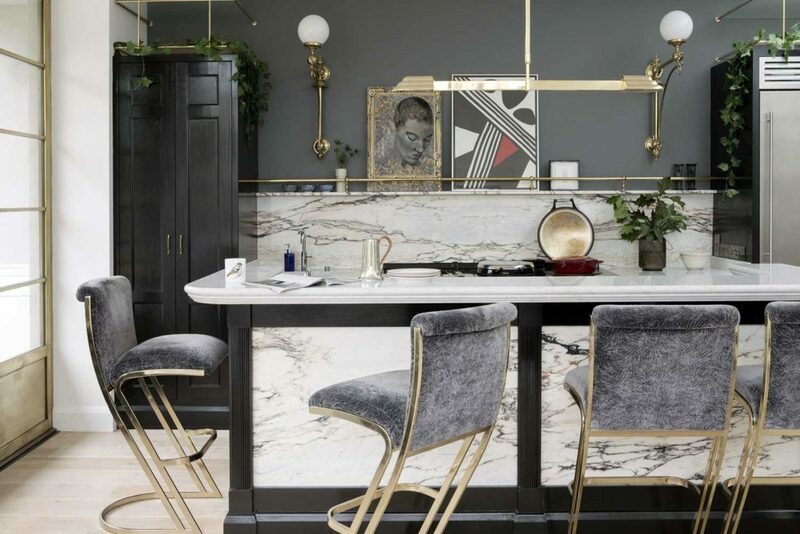 The black lacquered bistro-style kitchen was inspired by a visit to Paris. Once Eva was clear about what she wanted, Suzie set about designing it with backlit Calcutta marble and help from kitchen maker Conall Nolan. Brass bistro lighting was added along with 1960s brass bar stools from Mid-Century Online, upholstered in Zoffany fabric. 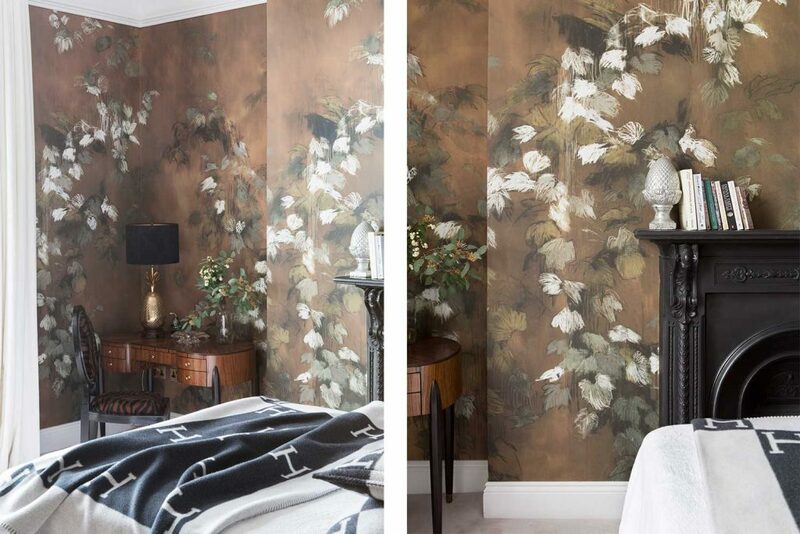 Eva and John chose hand-painted Italian wallpaper for their bedroom. The kidney-shaped table in the corner from Mid-Century Online is one of Eva’s favourite purchases. Hermes throw completes the bedding. Left: Coral Nolan Custom Furniture built the vanity units in the master bathroom to tie in with the kitchen. 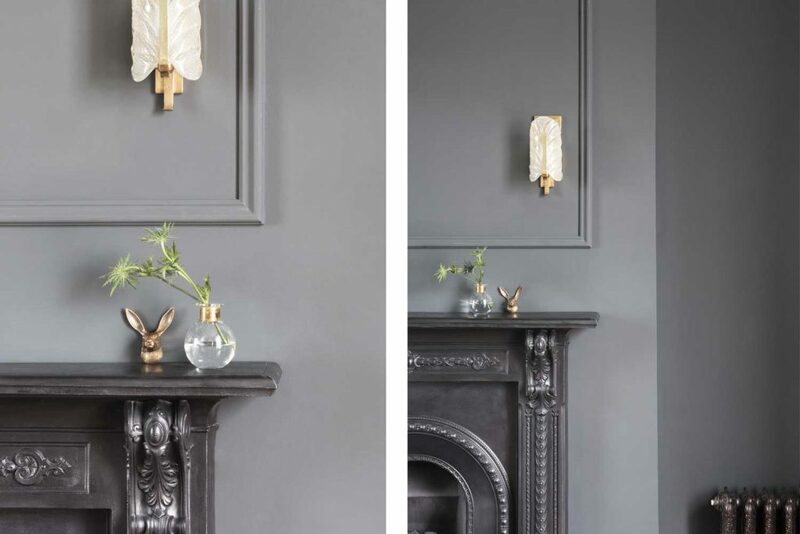 Antique touches were added to every room and this room is no exception, with vintage lights from Niall Mullen Antiques. Right:Tiles digitally printed with a portrait from the V&A Museum cover the back wall of the shower in the master bathroom. Original fireplace and vintage lights from Niall Mullen Antiques. Originally the kitchen of the house until Eva and John decided to move it to the back to gain more light, the utility room is kept relatively clutter-free with storage along both walls. 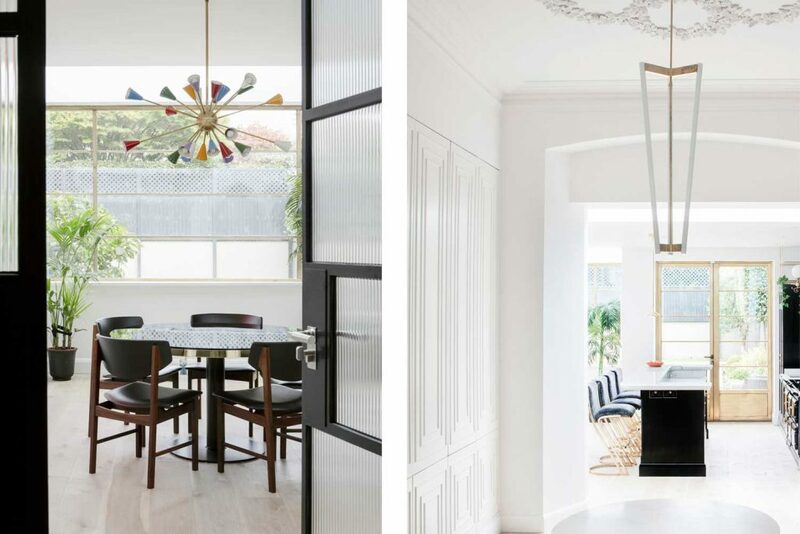 “We spent a long time wondering what to do with this room until our architect Suzanne pointed out that there’s nothing more luxurious than a room that doesn’t need to be anything,” notes Eva. 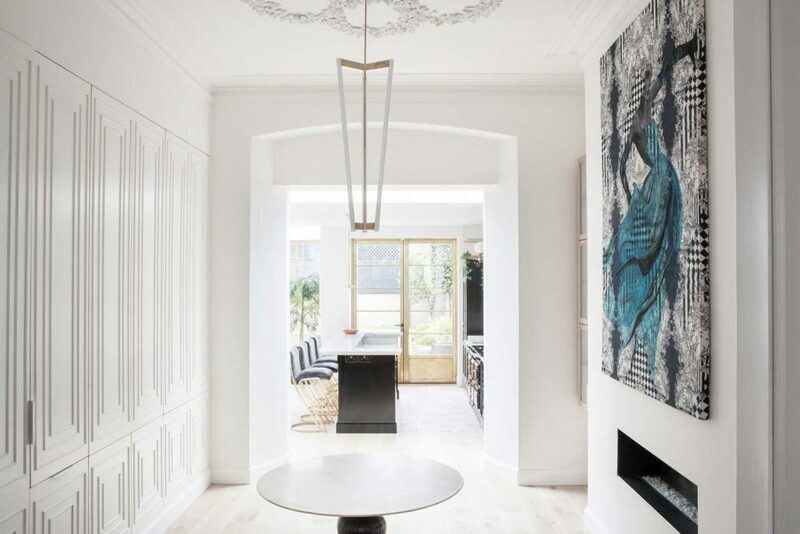 Coving and moulding were added as finishing touches along with a pendant light by Michael Anastassiades, a beautiful marble table from Michael Mortell and one of Eva’s signature pieces ‘Metropolitan Girl’, inspired by a picture of a girl from The Met Ball. 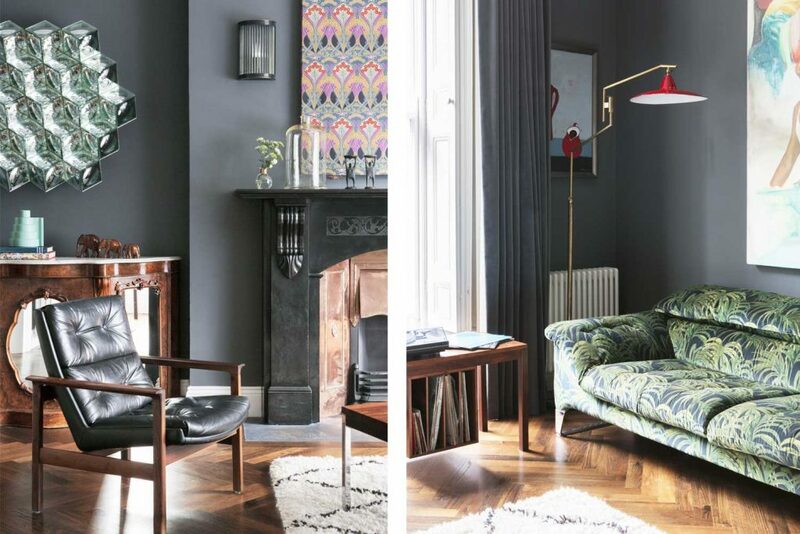 Left: In stark contrast to the upstairs drawing room, the living room is painted in the moodier hue of Pantone Grey, with dark oak floors. The pair of 1960s cube mirrors, bought by Eva years ago. 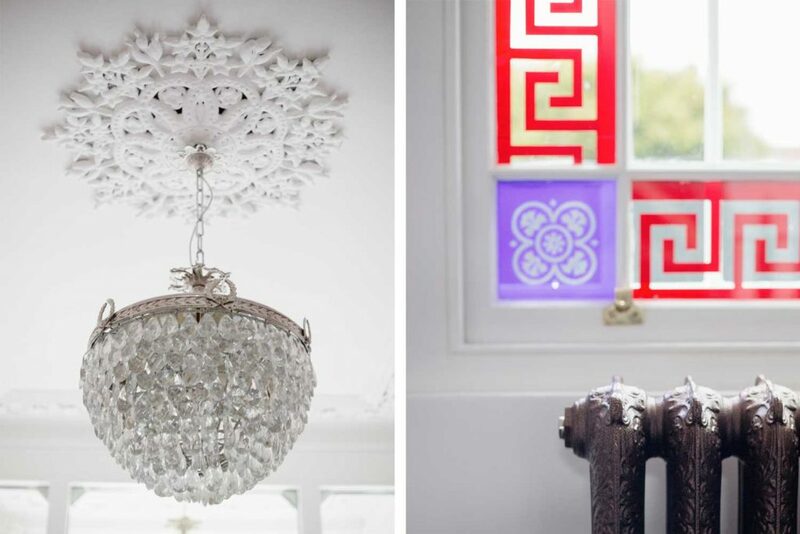 are originally from a nightclub in Brussels, and were purchased from Décor on Camden Street in Dublin city. The family of elephants belonged to Eva’s mother. Right: The Roche Bobois couch is covered in colourful House of Hackney ‘Palmeral’ print fabric; the red and brass enamel light is from Michael Mortell and on the wall beside hangs a painting by Cheung Zhu, a fellow art student of Eva’s; Mid-Century Online’s record player stand sits in the bay window and a Beni Ourain rug covers the dark oak floor. 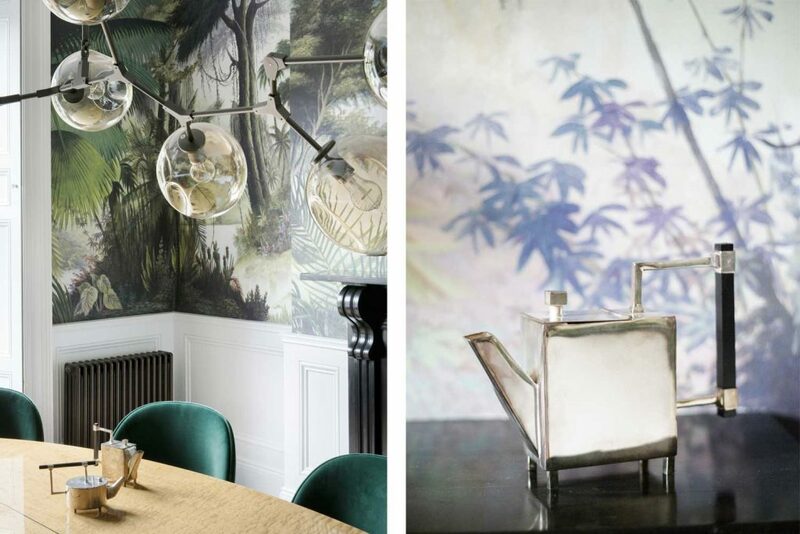 The beautiful hand painted wallpaper in the dining room, available from suziemcadam.com, was custom made and Eva’s ‘bravest decision’ when it came to decorating the interior. Eva and John debated for quite some time over the oval dining table from Niall Mullen antiques. 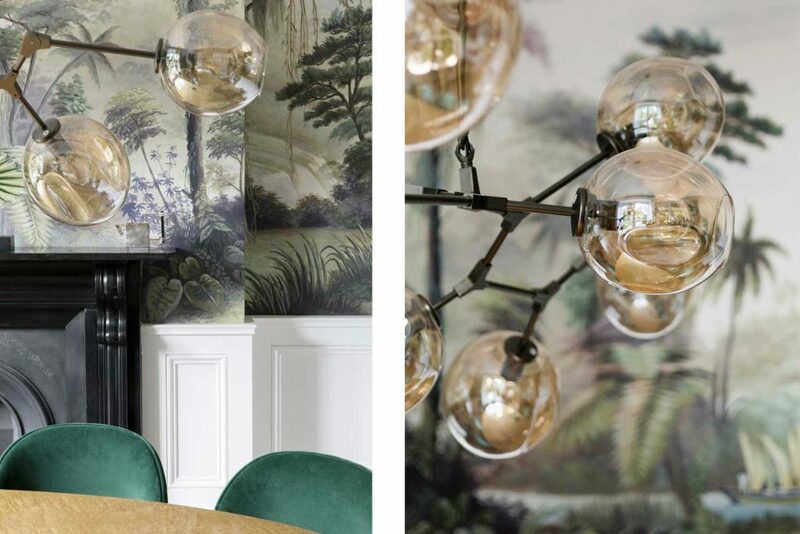 Green velvet Gubi dining chairs make a bright and elegant addition to the room as do the vintage wall lights from Niall Mullen Antiques and the black lacquered side board from Mid-Century Online.